The Seattle Mariners visit Wrigley Field on Friday to play the Chicago Cubs. The probable starters are Hisashi Iwakuma for the Mariners and Jon Lester for the Cubs. The opening line for this matchup has Seattle at +185 and Chicago at -200. The over/under was set at 7.5. The Mariners have a 48-47-5 over/under record and a 50-50-0 run line mark, meaning they cover 50% of the time. The Cubs are 51-49-0 against the run line and have a 47-47-6 over/under record. They cover the spread 51% of the time. The Mariners head into this matchup with a 51-49 record, including 26-26 on the road. Starting pitcher Hisashi Iwakuma has a 11-6 record with an earned run average of 3.96 and a WHIP of 1.28. He has 94 strikeouts over his 127.1 innings pitched and he has given up 132 hits so far this season. He has allowed 9.3 hits per 9 innings and he has a FIP of 4.41. The bullpen this year has an earned run average of 3.68 and they have given up 273 base hits on the year. Teams are hitting .226 against the bullpen while being struck out 357 times and walking 116 times this season. As a team, Seattle has allowed 8.79 hits per nine innings while striking out 8.4 batters per nine. They are 11th in the league in team earned run average at 4.02. The Mariners pitchers have collectively given up 873 base hits and 399 earned runs. They have allowed 131 home runs this season and they allow 1.3 homers per nine innings as a staff. Seattle as a pitching staff has walked 289 batters and struck out 835. They walk 2.9 men per 9 innings while striking out 8.4 per 9. They have a team WHIP of 1.30 and their FIP as a unit is 4.26. As a team, Seattle is batting .260, good for 12th in the league while putting together a .265 average away from home. The Mariners hold a .438 team slugging percentage and an on-base percentage of .328 which is good for 10th in baseball. They rank 13th in baseball with 8.9 hits per game. Robinson Cano comes into this game hitting .301 and his on-base percentage is at .360. He has 122 hits this season along with 67 runs scored and 63 runs batted in. He's struck out 63 times and has walked 31 times. Nelson Cruz is hitting .285 and he has an on-base percentage of .370. He has totaled 103 hits so far while scoring 58 runs and he's driven in 66. He has walked 41 times and has struck out 100 times. The Mariners have 890 hits, including 159 doubles and 143 home runs. They've stolen 27 bases while they've been thrown out stealing 22 times. Seattle has walked 311 times this season and they've struck out 783 times as a unit. They've left 662 men on base and have a team OPS of .766. They score 4.75 runs per contest and have scored a total of 475 runs so far this year. Chicago comes into this matchup with a 31-16 home record and a 60-40 overall mark. With an earned run average of 3.09, Jon Lester has a 10-4 record and a 1.11 WHIP. He has 118 strikeouts over the 122.1 innings he's pitched during which he has given up 100 hits. He has allowed 7.4 hits per nine innings and his FIP stands at 4. So far this season the bullpen has an earned run average of 3.68 and they have given up 221 base hits on the year. Teams are hitting .208 against the Cubs bullpen while being struck out 295 times and walking 123 times this season. As a team, Chicago has allowed 7.02 hits per nine innings while striking out 8.88 batters per nine. They are 1st in the league in team earned run average at 3.25. The Cubs pitchers as a team have surrendered 703 base knocks and 328 earned runs so far this season. They have given up 103 home runs this year and they give up 1.1 home runs per nine innings as a staff. Chicago as a staff has walked 311 hitters and struck out 886. They give up a walk 3.1 times per 9 innings while they strike out 8.9 per 9. Their team WHIP is 1.13 while their FIP as a staff is 3.83. As a team, they are batting .254, good for 15th in the league while putting together a .241 average at home. The Cubs hold a .429 team slugging percentage and an on-base percentage of .345 which is good for 2nd in baseball. They rank 16th in baseball with 8.61 hits per contest. 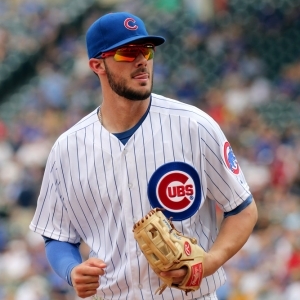 Kris Bryant comes into this matchup batting .283 and he has an OBP of .377. He has 107 hits this year along with 81 runs scored and 66 RBI. He's struck out 101 times and has walked on 46 occasions. Anthony Rizzo is hitting .287 and he has an OBP of .396. He has collected 102 hits so far while he's scored 60 runs and drove in 76. He has earned a walk 53 times and has punched out 69 times. The Cubs as a unit have 861 base hits, including 182 doubles and 128 homers. They have 42 stolen bases while they've been thrown out 23 times. Chicago as a team has walked 419 times this year and they have struck out 848 times. They've had 751 men left on base and have an OPS of .774. They score 5.06 runs per game and have totaled 506 runs so far this season.